Events from J’s and N’s lives. I’ve had my umbrella for a long time. I think I got it in middle school. So the canopy is getting a little worn, especially where the skeleton folds. My first thought was to patch it, but the fabric is unusual. Fortunately, those nylon umbrella sleeves are perfect for cannibalizing. I often find them abandoned on the ground. We also have a ton at home that are never going to be used. These patches are from an umbrella sleeve I found in Pittsburgh. 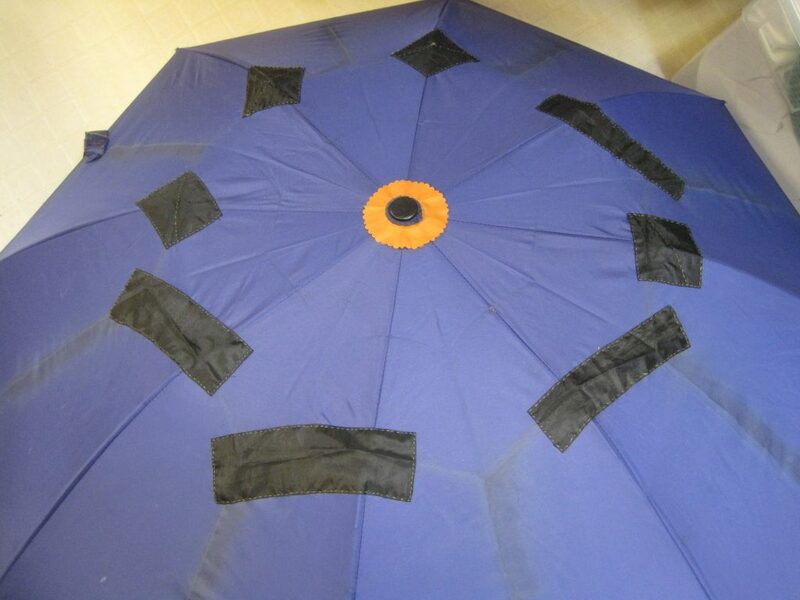 The orange circle is also an umbrella part I picked up. Okay, my patch placement and shaping were not ideal… Maybe if they were all the same shape, size, and orientation it would work. 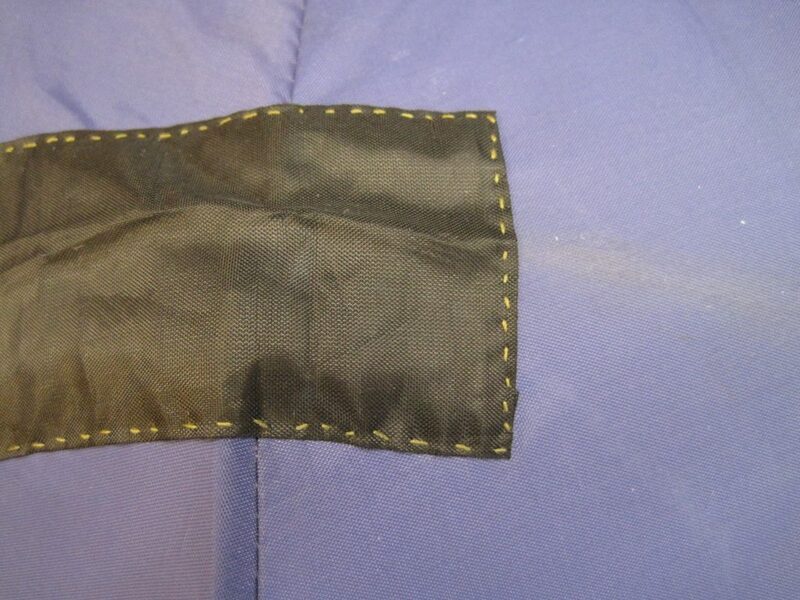 At least the patches were sewn very neatly! I even hid the raw edge of the fabric. I intend to keep this umbrella forever, and I have many more, variously colored umbrella sleeves to use (: Hopefully my umbrella looks more purposeful in a few years, once I get a few more patches on. My mom bought me 6.5 pounds of tallow from the butcher for $0.88/lb! 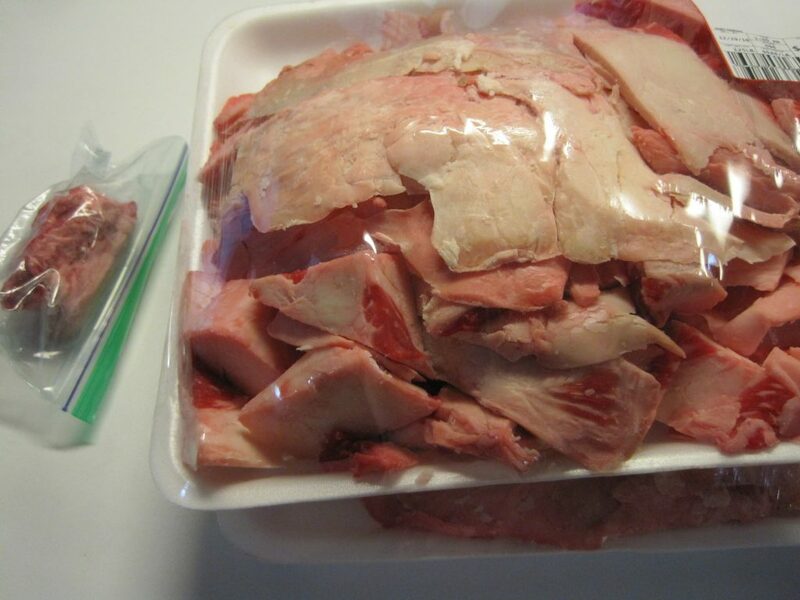 Tallow is so cheap (and sometimes free) since it is a byproduct of eating meat; most of the time, it is thrown away. The fat in the little bag to the left was trimmed off of a steak. Then you add lye and other goodies, and mix. The soap in this photo is just about done. 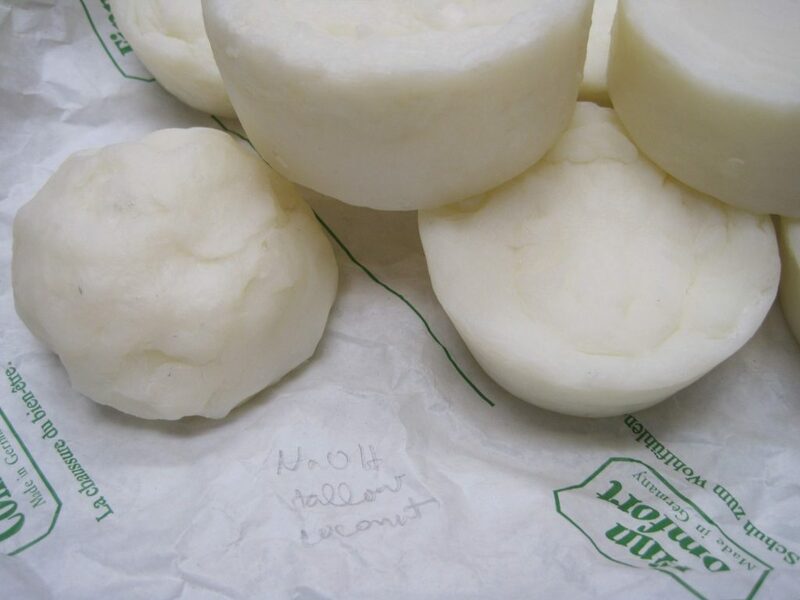 I’ve been making hot-process soap using our slow cooker since cold-process can be finicky and requires a lot of mixing. Then you pour it into molds. 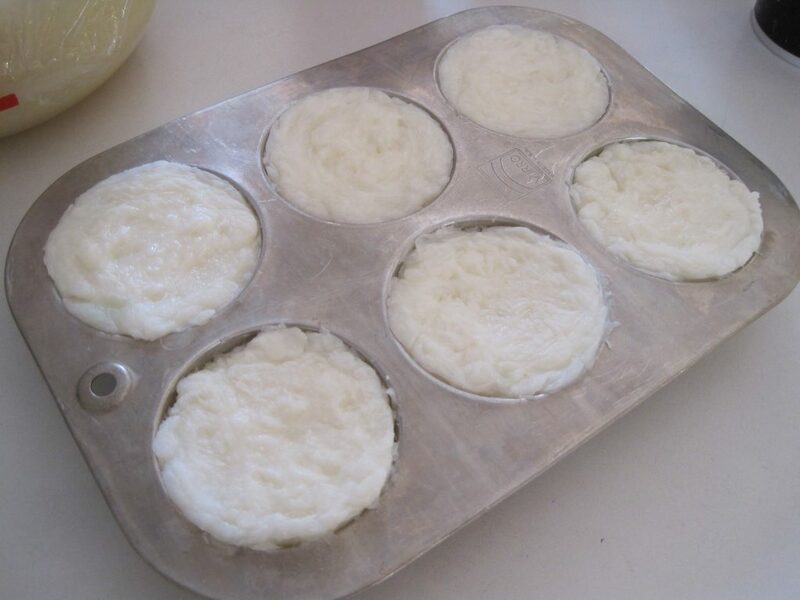 I variously used a muffin tin and plastic drink cups. 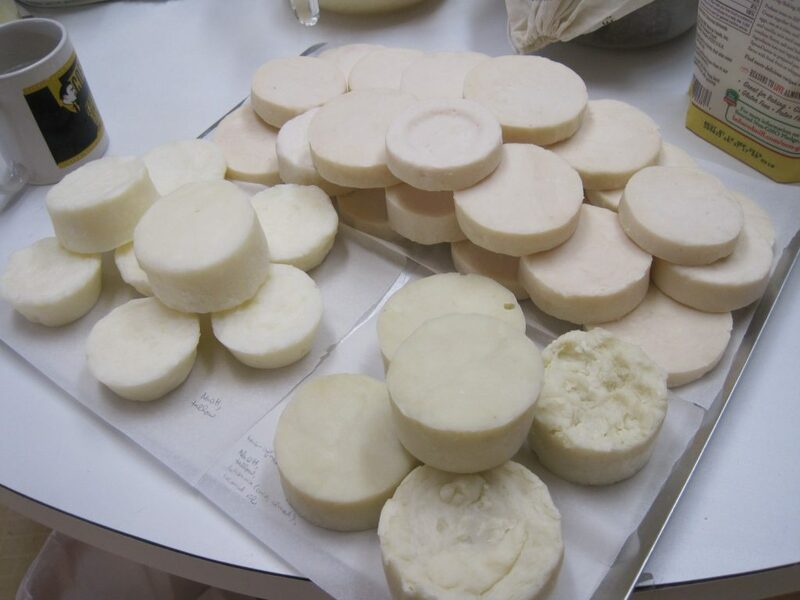 To create the shaving soap, I mixed the NaOH and KOH batches together to get a good texture. 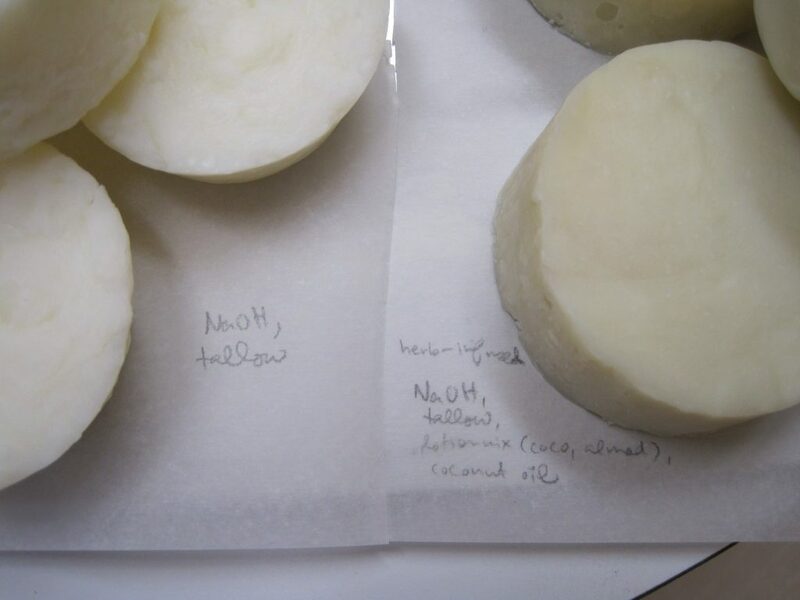 Stearic acid is too hard to use NaOH only, but not hard enough to use only KOH, which is meant for creating liquid soap. This is called a dual-lye soap. One batch of attempted soap boiled over and was lost ): I pre-melted the oils and they got too hot, so that when I added the lye-water, it boiled immediately, forming a lye volcano. Fortunately, no one was injured (except the crock pot, whose paint is a little corroded…). Hot-process soap is a little gloopy when it’s done, so it can be hard to put into molds. 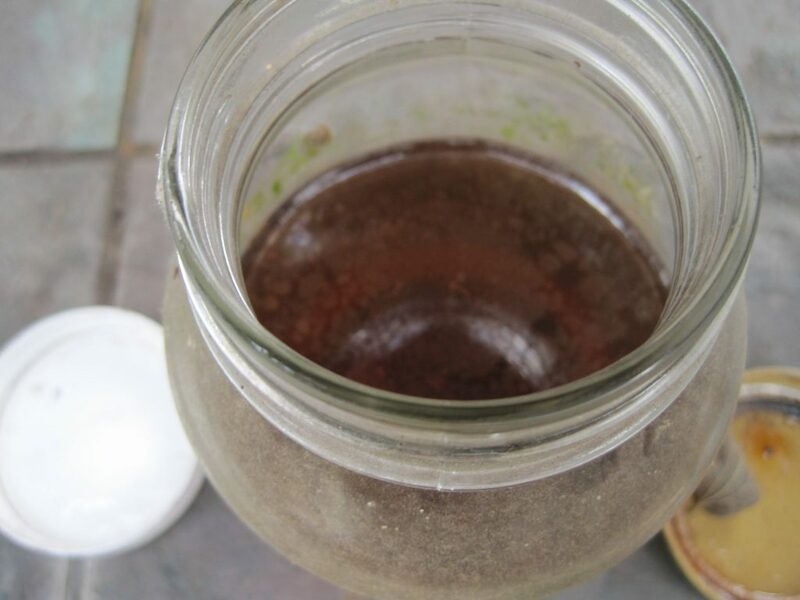 You can mix in additional water to improve pourability, but the soap will have to cure longer to reach the desired hardness. Curing. Shaving soap in the back. The two front soaps are hair soap for sibling C, but could also be used for general hand and body cleaning. The greenish one on the right was infused with plant materials from our garden (yaupon, rosemary, sage, and lantana). As it turns out, you need a ton of plant matter to do anything. Shaving soap. The glycerin made it a little orange. 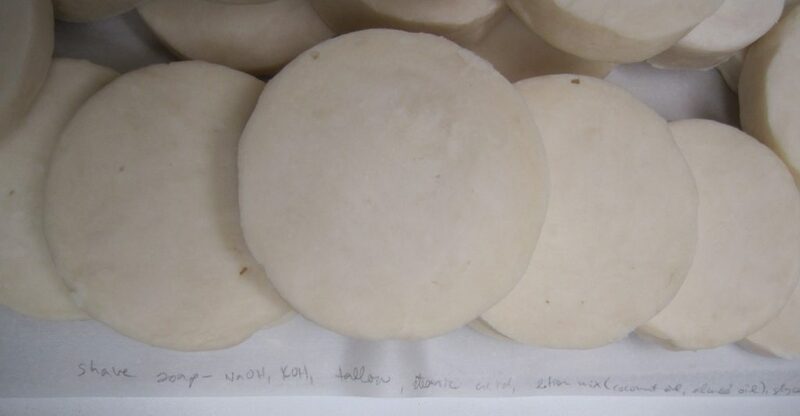 Tallow + coconut oil soap. 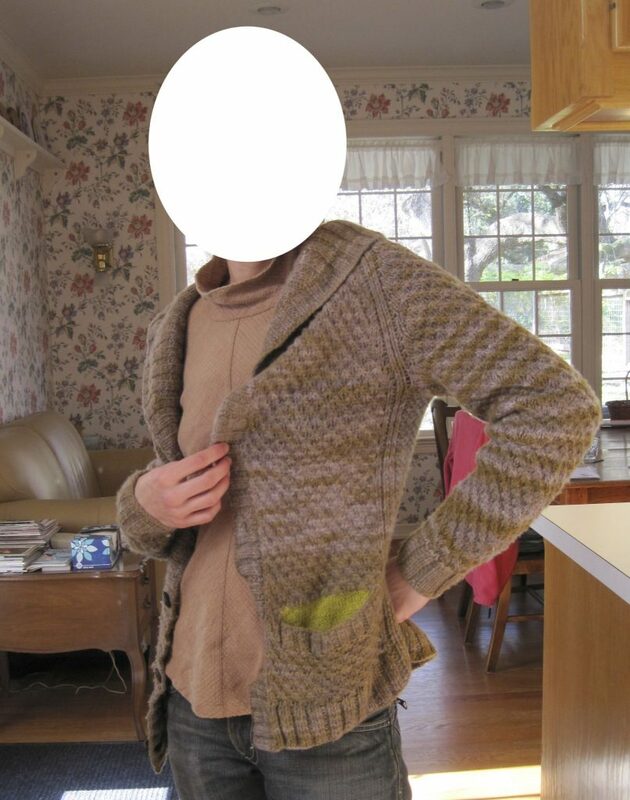 I made a raglan shawl-collar cardigan out of Manos del Uruguay Maxima yarn, in the color “Reindeer”. The yarn is very pleasant to work with, but being made out of single-ply merino wool it wears very poorly and gets very pilly. The pockets also gape open. The collar is too floppy and doesn’t sit close enough to the neck. 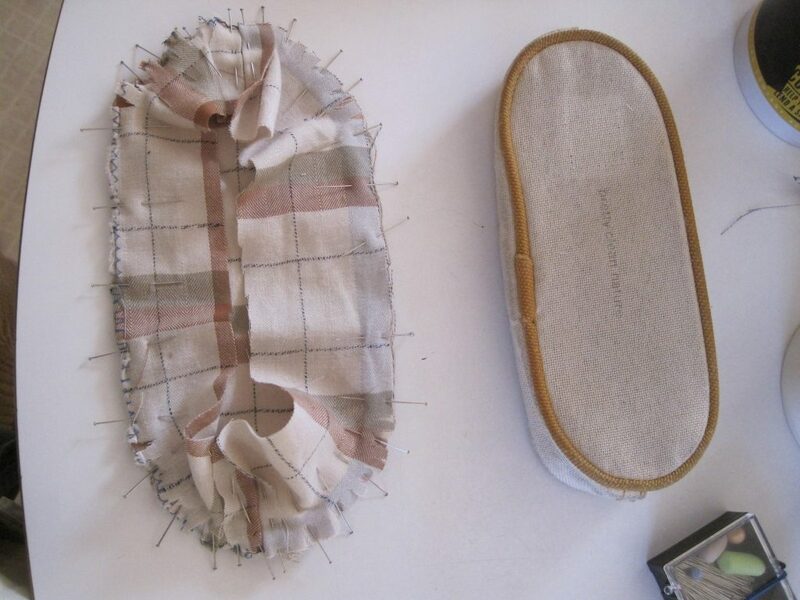 The body uses star stitch. The sleeves use raglan shaping. The front placket and collar use 2×2 ribbing and short-row shaping. The buttons are (real!) leather with a metal shank. They were purchased from Austin Creative Reuse for a dollar. The yarn cost about $100 altogether. Underarm panel of seed stitch. 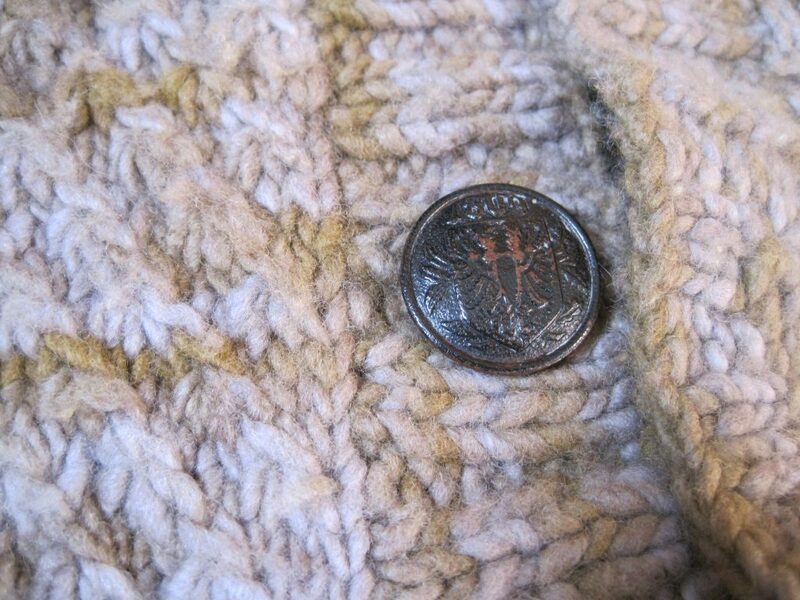 The pockets are knit from ugly green alpaca yarn that I got for free from someone who thought it was too ugly to use. 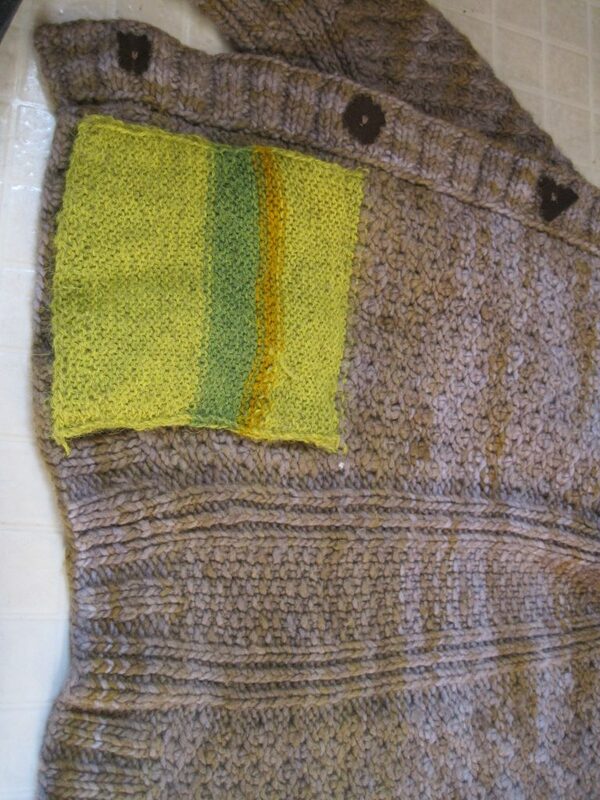 The darker green and gold stripes in the photo were my attempts to overdye the yarn with indigo and turmeric. 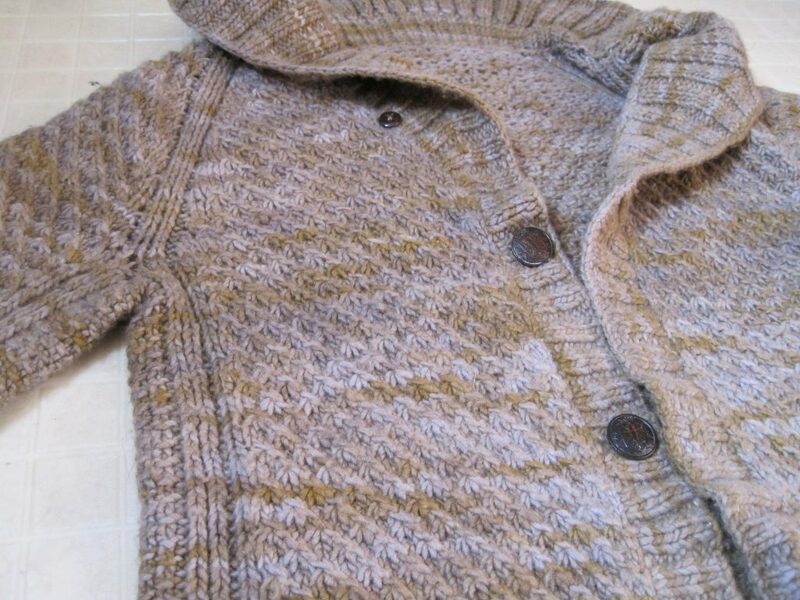 The sweater was knit back and forth, starting at the bottom. 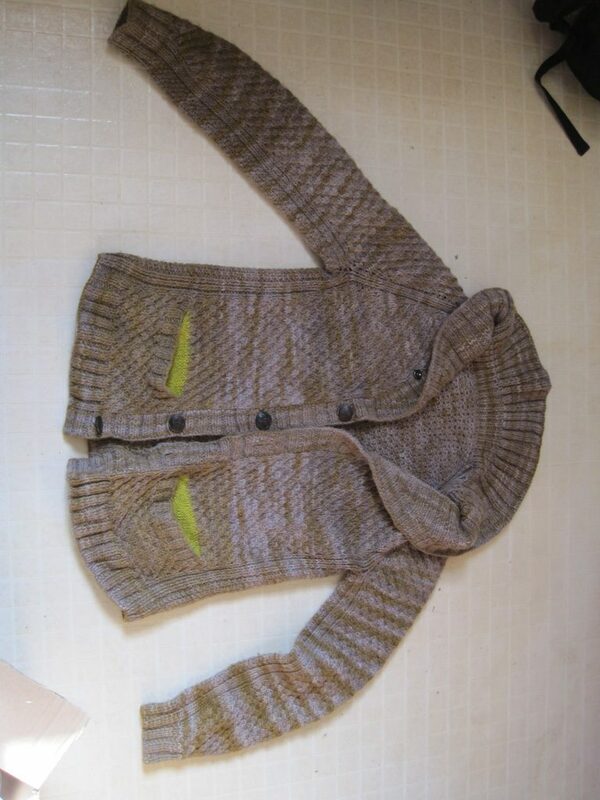 The sleeves were knit in the round down from the yolk. 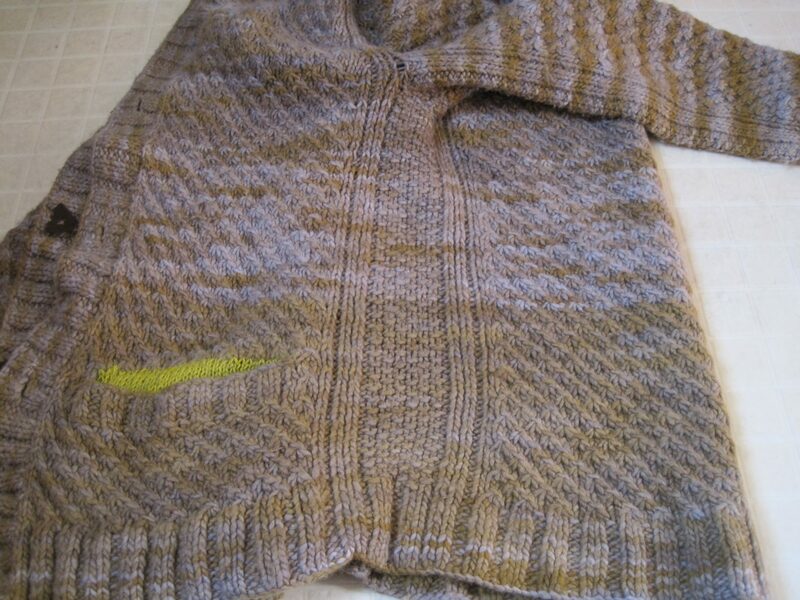 The front placket and collar were knit back and forth from stitches picked up along the edge of the body. 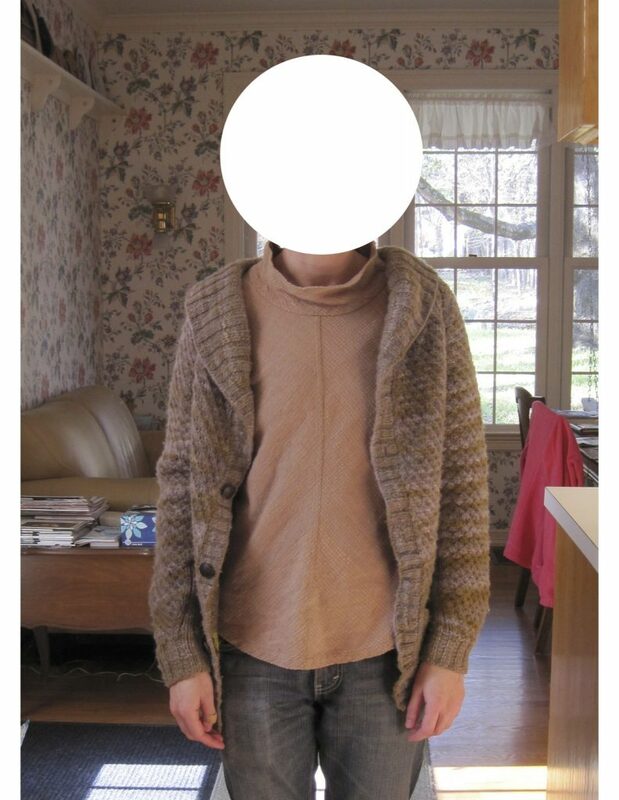 The sweater has false seams between what would normally be separate pieces (front panels, back, and sleeves). 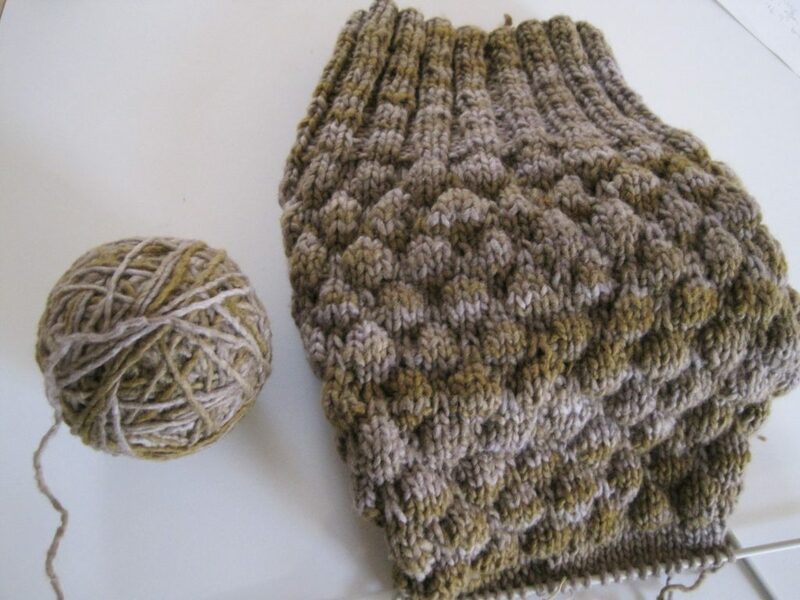 I knit kpk, then sewed the two knit stitches together to help stabilize the sweater’s shape. Since fit and material were major problems with the sweater, I decided to take it apart and make new items that would better suit the merino wool. 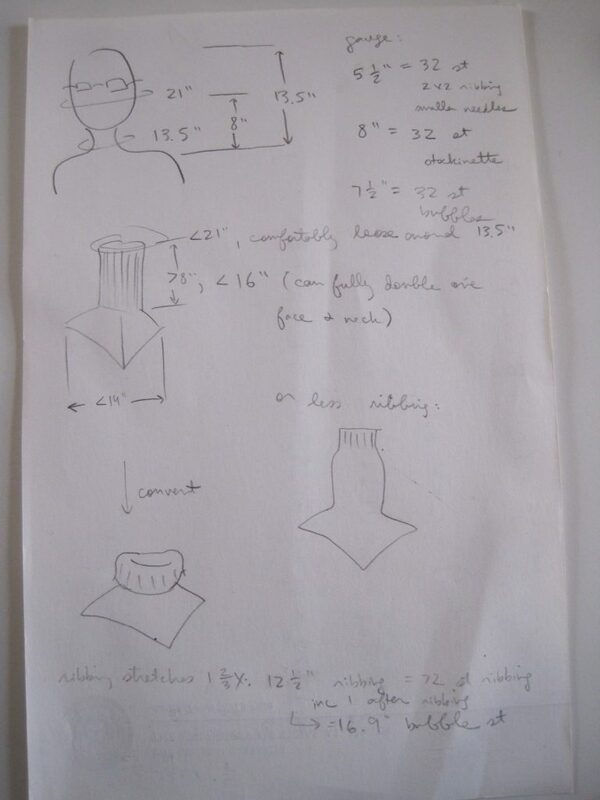 The first item will be a cowl (or a dickie, since it will include some shoulder/chest cover)! My current scarf is kinda itchy and the ends are always in the way or coming unwound. The cowl so far. I’m using bubble stitch, which is currently in vogue. My goal is to create a textured fabric that better traps warm air, similar to how waffle-knit fabric works. I’m in Austin for the holidays. Most of my time has been spent going to yearly doctor checkups and doing various crafts. 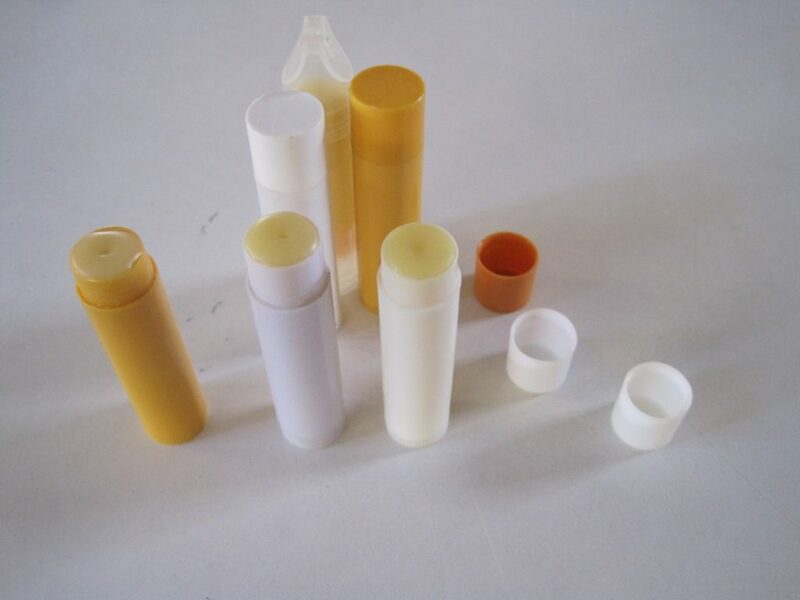 Made more chapstick! I found two chapsticks on campus this year. People seem to shed them all over the place. The vinyl lining of my pencil pouch fell apart, so I sewed a new one from cotton twill I bought from FabMo in Mountain View. I’ll talk about bigger projects in other posts. At sibling C’s request, I dyed more socks. The dyes have been sitting outside for a year and the labels have all worn off, so I’m not quite sure what I used. Either avocado skins and pits, or prickly pear fruits (tunas). 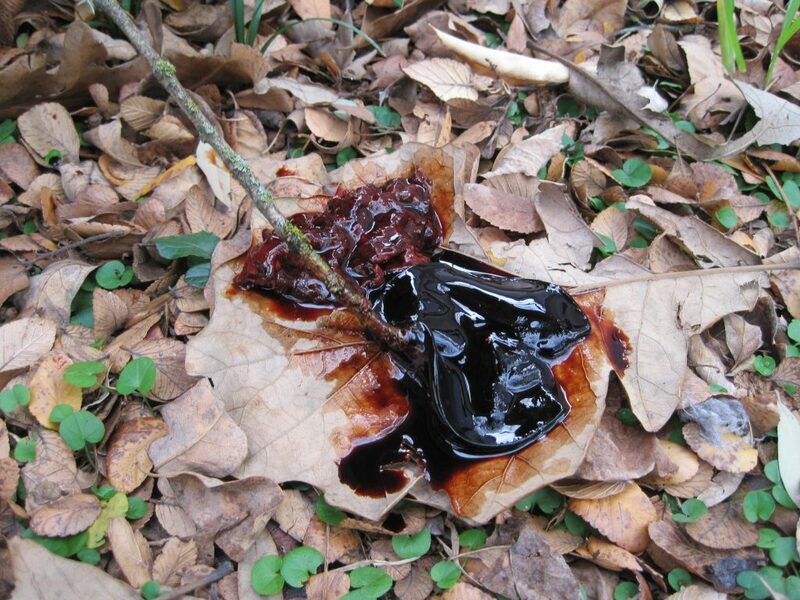 The dye is a dark maroon-brown color. And we pulled these oddly organ-esque growths out of it. One looks like liver and the other looks like brain. I’m pretty sure both growths are scobies or mothers, symbiotic growths of fungi and bacteria. Specific species appear in the scobies used to make kombucha. 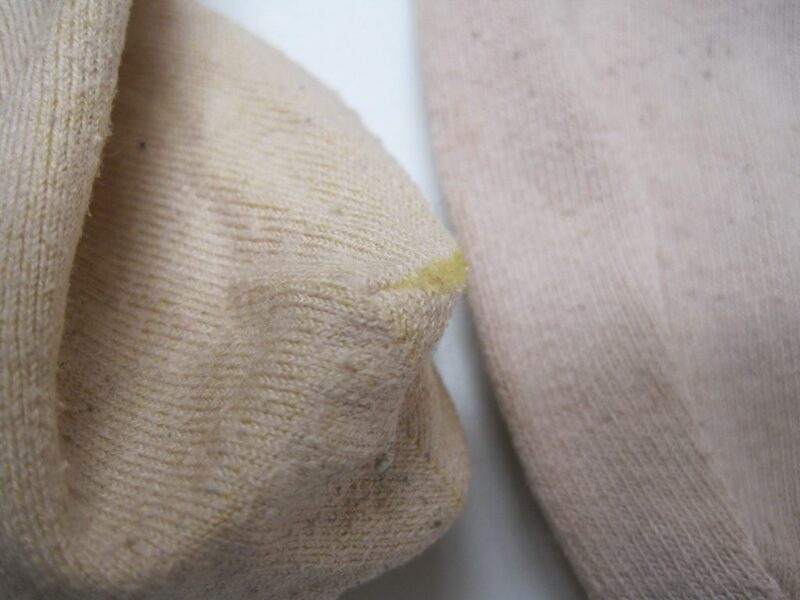 The resulting socks (the colors are slightly brighter in real life…). I boiled a pair in each dye for several hours, then left them to sit for a couple days at room temperature. 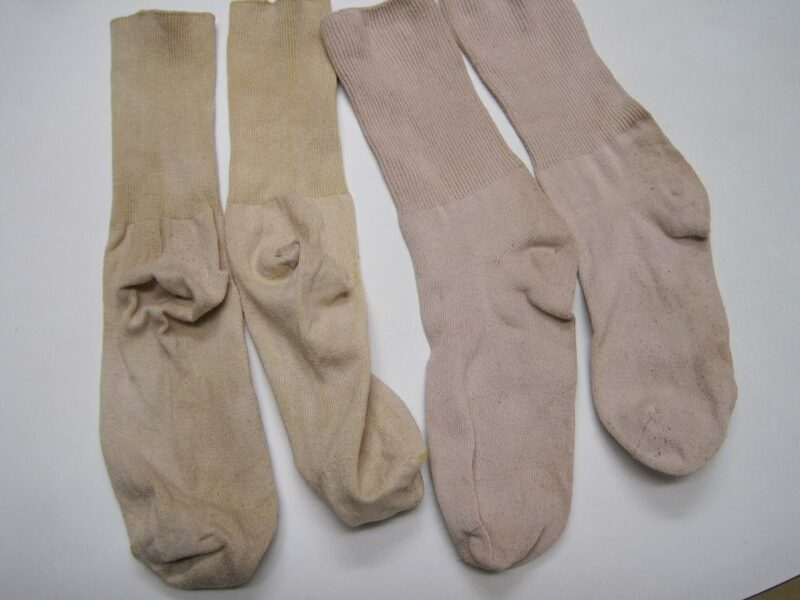 These socks are made of nylon and cotton, neither of which is particularly easy to dye. 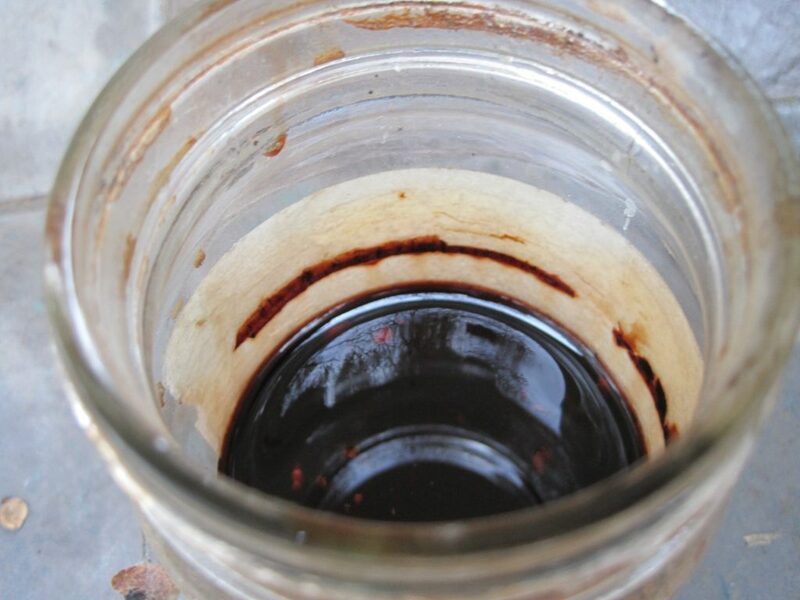 It looks like onion dye sticks better to nylon than to cotton. I’d love sibling C to grow some native indigo for me. The only problem is finding plants or seeds. If anyone has a source, let me know! There are some good foraging opportunities near my apartment. 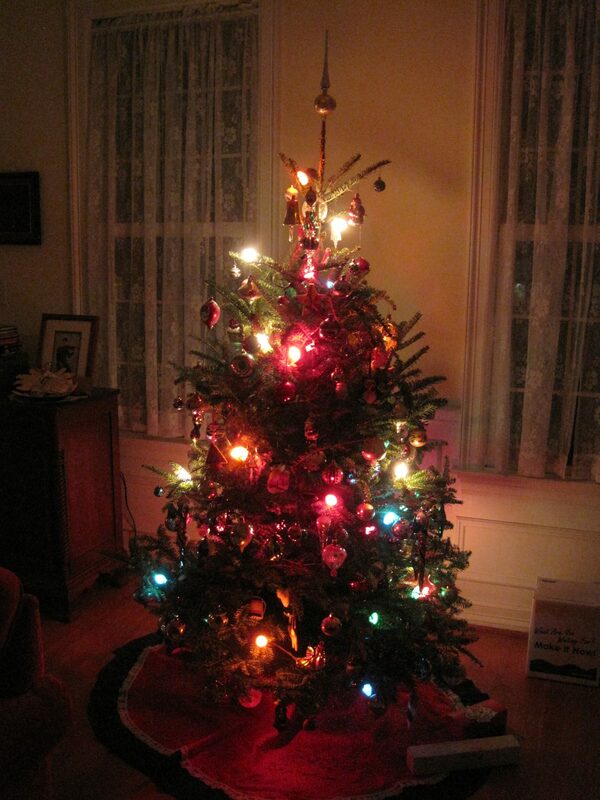 The best is a pear tree – I believe it is ornamental since the pears are small. It wasn’t clear to me if the owners were interested in the pears, so I just collected ones that had fallen onto the sidewalk, and made pear-sauce! 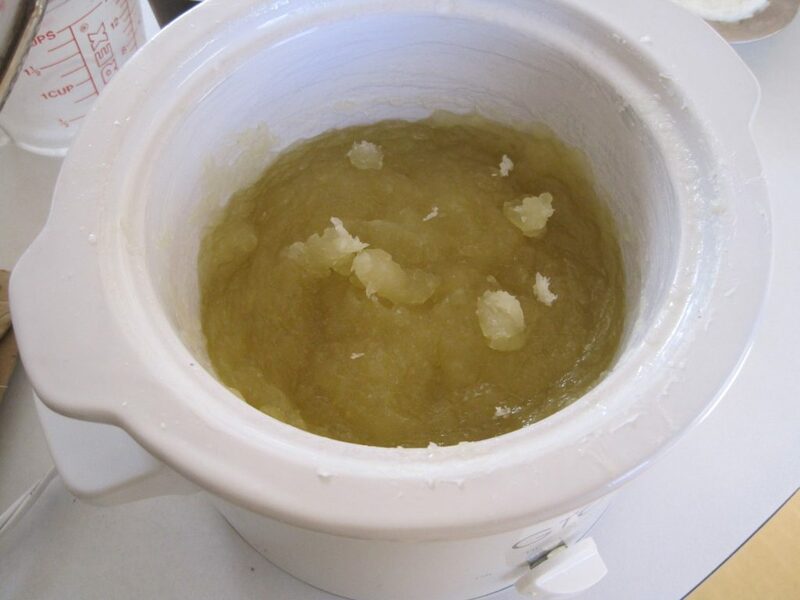 I strained the cooked pears through a mesh strainer, and used the remaining fibrous matter to make alcohol. There are also a ton of sugar maples. If I had tapping equipment, I could make maple syrup. And lastly, there are a ton of chestnut trees. Unfortunately, they are horse chestnuts, not true or sweet chestnuts, which were largely killed off in the early 1900s by chestnut blight. The only trees that survived were those far enough (about 10 km) away from other chestnut trees. 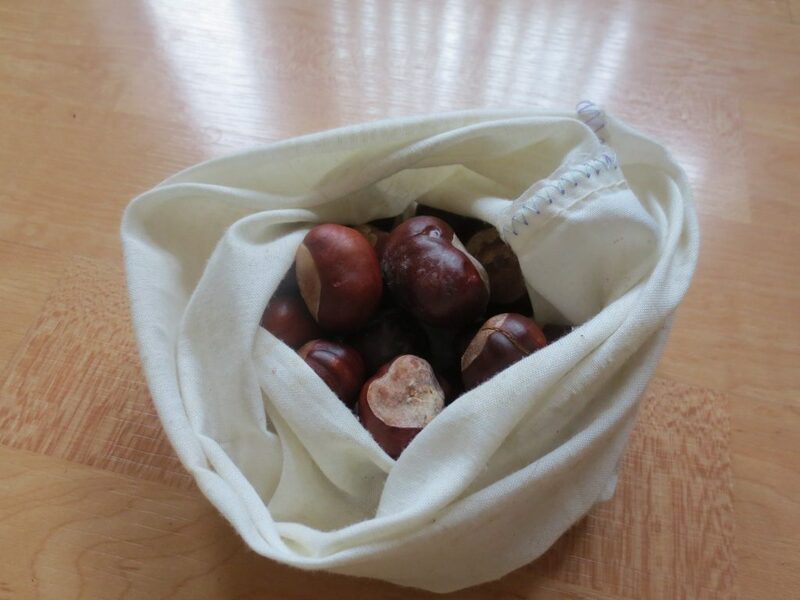 Horse chestnuts contain high levels of naturally-occurring saponins, which make them taste really bitter. Apparently, they are also poisonous. Before realizing this, I collected a bunch. I was super excited to find chestnuts since they’re pretty expensive to buy. Horse chestnuts really look quite similar to true chestnuts. The main difference, besides taste, is the lack of a tassel on the tip of the shell. 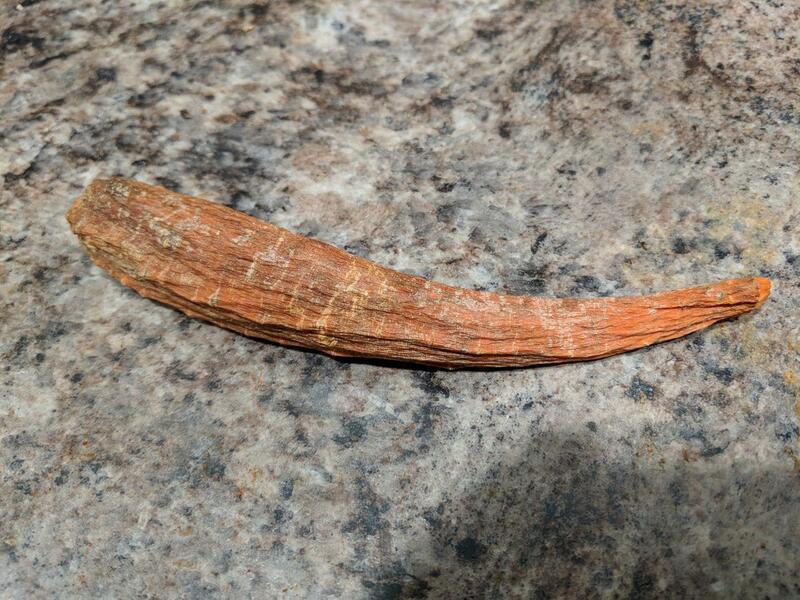 True chestnut husks also have more closely-set spines. As far as I’m aware, horse chestnuts only have one use: making liquid soap! 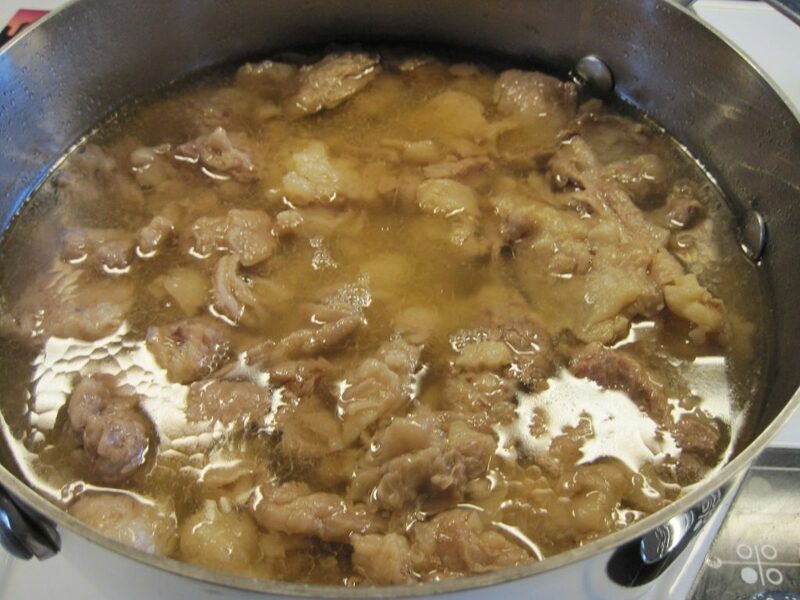 You can soak the nutmeats in water to dissolve the saponins, and use the soaking liquid as liquid soap or detergent. Soooooo, I decided to invest in an electric hair trimmer, the type with guards. Only $25 used on eBay, about the same cost as a single mid-tier professional haircut! Unfortunately, in the first attempt, I received an alarm clock. 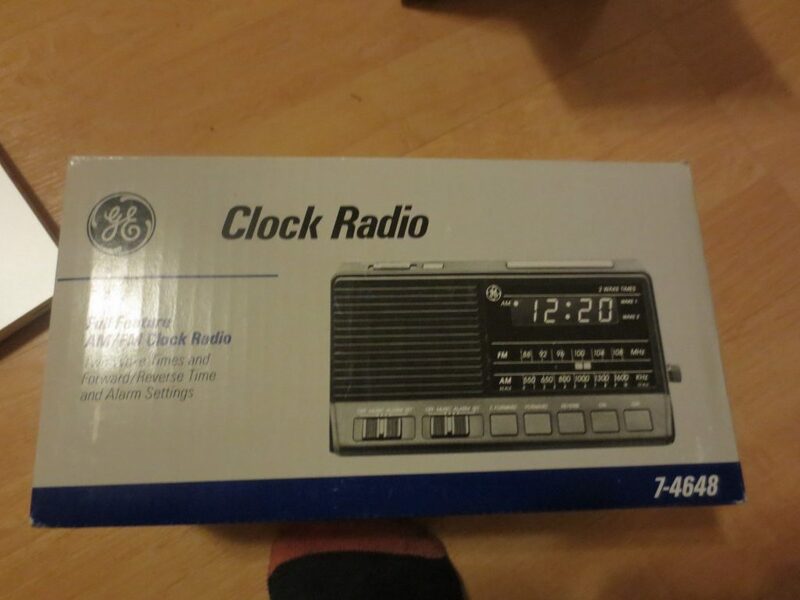 At least it’s a fancy alarm clock? The trimmer works well! I’m not sure if my haircut is good, but at least it’s even. I went bouldering yesterday with Friend A. After we finished, we happened across Friend B at the gym, and the three of us planned to have dinner together. Unfortunately, Friend A has decided as of late that his diet must consist solely of Panang Curry Chicken from Siam Royal. 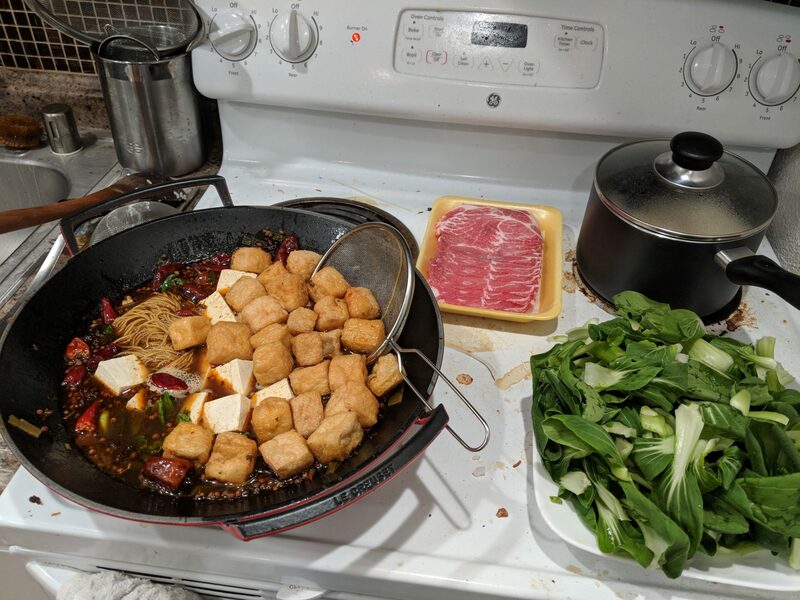 After much protest from Friend B and I, we managed to grudgingly convince Friend A to have homemade hot pot instead. 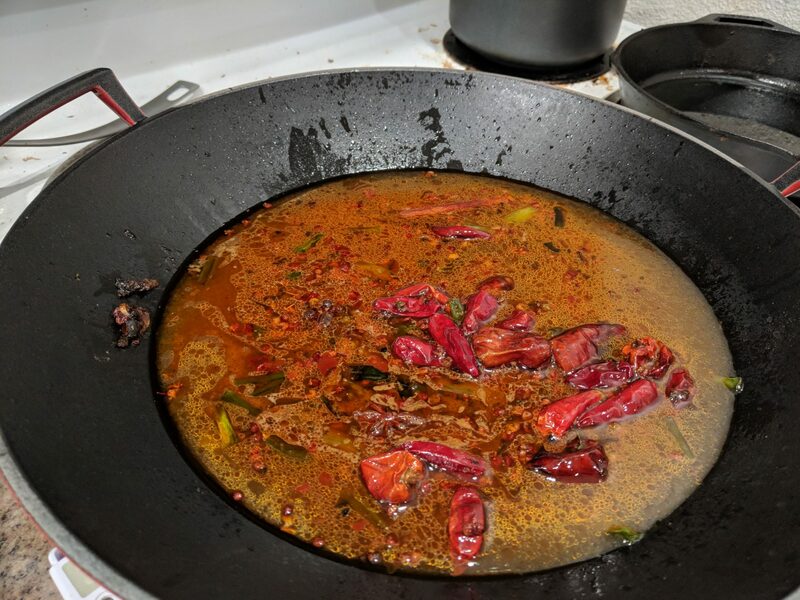 I haven’t been using my Sichuan seasonings at a fast enough rate, so I decided to make Sichuan-style hot pot. 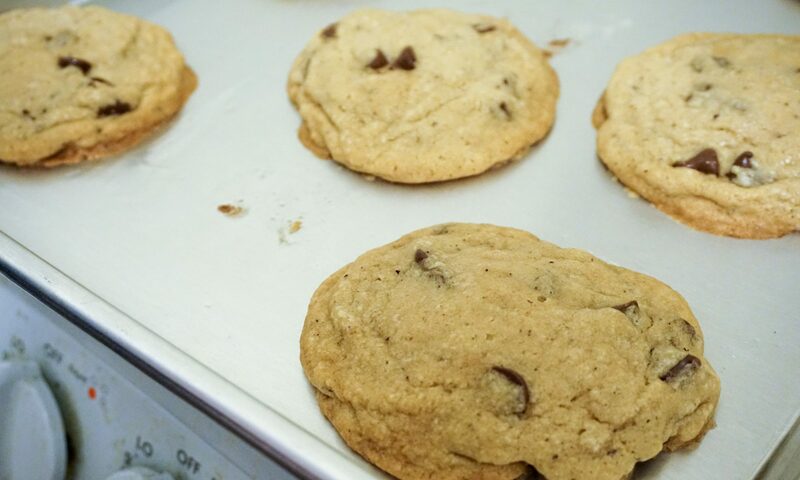 Here’s the recipe. Unfortunately, I don’t have a table-top burner, so we had to make due with eating around the stove in the kitchen. My kitchen isn’t so clean. Maybe a B health rating. 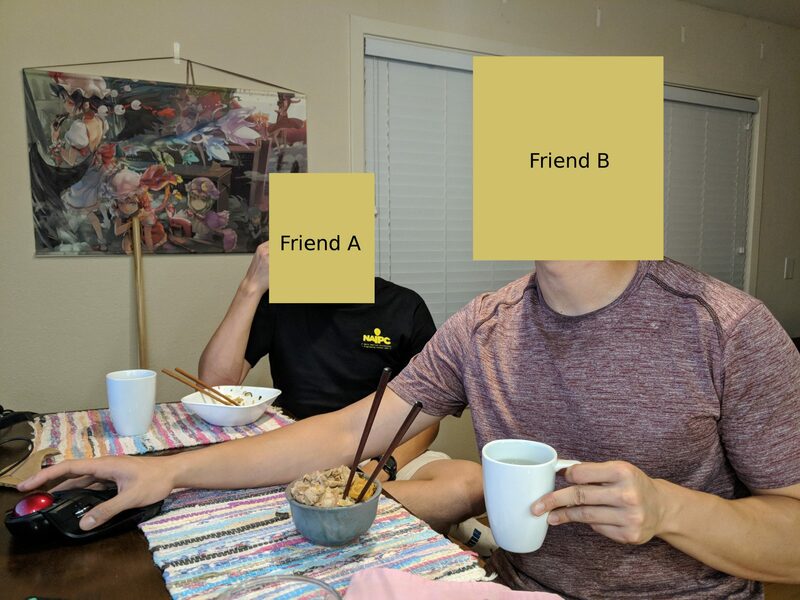 Friend A and B, shown here eating hotpot while critiquing r/MachineLearning (apparently it’s trash or something). Overall, it was pretty good. 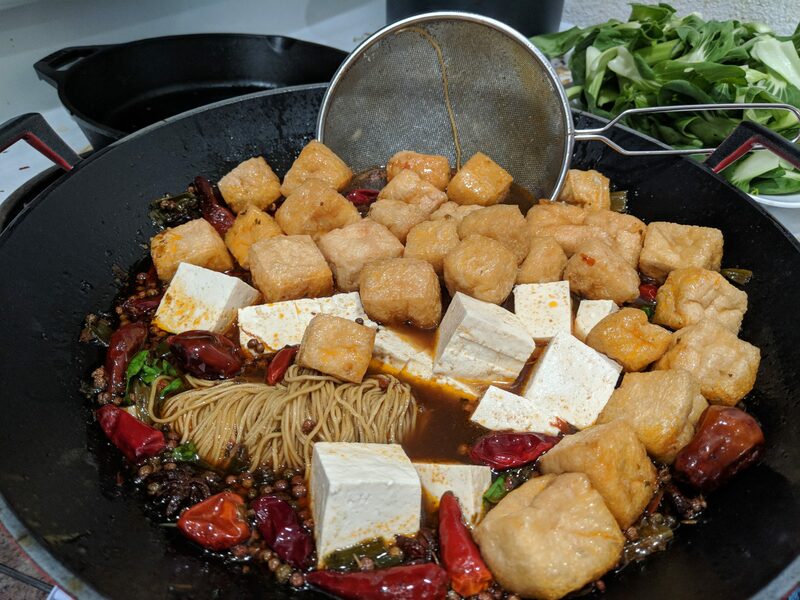 And much cheaper than the Sichuan hotpot at Haidilao. After hotpot, we watched the heartwarming new show Goblin Slayer. Interestingly, it seems like it’s a show about slaying goblins. Sibling C has a new Instagram page about her garden. Check it out!